Hendrik Frans van Lint, called Lo Studio, Flemish painter, active in Italy. A native of Antwerp, Van Lint moved definitively to Rome in circa 1710 and joined the confraternity of Northern painters working there, called the Schildersbent. He soon earned his nickname Lo Studio due to the painstaking precision with which he rendered both the figures and architecture in his paintings, and he often included his pseudonym when signing his works. 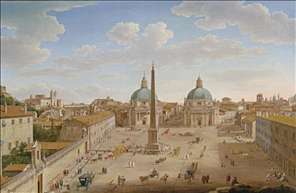 By the 1730s he had already made a name for himself painting vedute of buildings and monuments in and around Rome. 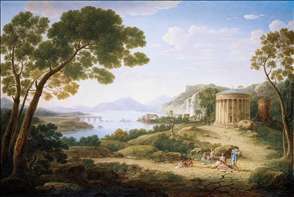 As well as painting topographical views of the sites and monuments of Rome Van Lint specialised in painting overtly classical subjects with bacchanals, gods and goddesses set in arcadian landscapes which are heavily inspired by Claude Lorrain. He often signed in the Italian form of his name: Enrico. 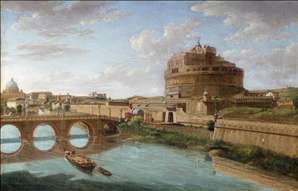 See more details about "Classical Landscape"
See more details about "Rome: A View of the Tiber"
See more details about "Roma: Piazza del Popolo"